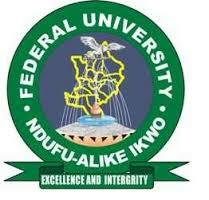 Federal University Ndufu-Alike Ikwo, FUNAI Postgraduate School Admission Screening Test Schedule, Screening Fee Payment Details for 2018/2019 Academic Session. The Federal University Ndufu-Alike, Ikwo (FUNAI), School of Postgraduate Studies has announced the Admission Screening Test Schedule and Fees for the 2018/2019 Academic Session. Date: Monday, 25th February, 2019.